Stefano is a very enthusiastic baker friend and fan of our recipes. he has already shared several of his excellent bakes with us, also in the yourloaves section of our site. 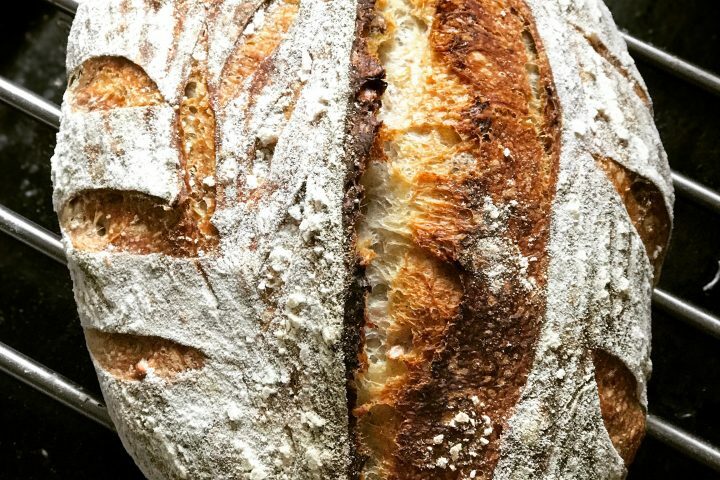 We envy him because he seems spoiled for choice when it comes to all kinds of excellent Italian bread flours he can experiment with to create wonderful loaves. We want to thank him for his contribution, his story and the inspiration he gives to us and other bakers! Passion, it’s all about passion. Not only for baking, it is something more, it is something that we (I have a twin brother and I often use we), well I, have in my DNA. My grandfather was a baker, a pastry chef, he started working in a bakery when he was 7 years old. He spent his whole life in his bakery and even after his retirement he continued to work in bakeries, he helped lots of young bakers to learn the “white art”. He was really inspiring, When I was 6 or 7 I used to spend hours in his bakery, staring at him, at his gestures, at his incredibly fast movements, all in perfect sync. My father was blind, since he was 3 years old, so he had to develop alternative skills. He was great in many ways, he was a Philosophy teacher at the high school and he was also able to do incredible things with his hands. I learned from him to repair a cassette recorder, to replace a broken water pipe, to build small wood objects, to play piano, to swim, even to fish (our family comes from Portovenere, close to the Cinque Terre, in Liguria, Italy). This explains why I love to use my hands to get in touch with the world around me. Baking is sort of the paradigm of using hands. Hands, flour, water and salt. Nothing else, well, one more thing, passion. Without passion you could easily give up, baking is rewarding but it also requires a lot of patience and time. I’ve a degree in Law, I’ve been working in the Information Technology industry for almost 20 years, in different countries, but I would stop working tomorrow if I had the opportunity to start a bakery. My roots are in the past, in the small, simple things. From this point of view, baking bread is something ancestral. My dream is to buy a country house, with a big garden where to grow everything I need, to bake bread, to go “off grid”. So far this is a dream, I keep working with computers, I travel a lot (50-60 flights per year) but every time I can spend one or two days at home, with the beloved ones, I bake bread, croissants, pancakes, focaccia and we love it. The walnuts bread you find below is one of our favourites. I prepare the poolish the evening before baking, and I make sure that the rye starter is very active when I make the poolish. I feed it 6 hours before making the poolish, so let’s say at 14:00 to be ready at 20:00. In the morning I mix the poolish with water, add the flours, the malt and 50 gr of rye starter. After mixing I let the dough rest for 45 minutes (autolyse). You use starter in the poolish and the dough? So 100g of starter in total? You are right, 100 g in total. Please could you give me your recipe for a rye sourdough starter. What is the purpose of the barley malt flour & is it needed? In general malt promote a strong rise, great texture, and lovely brown crust. We can also tell you, if you do not have it or don’t want to make it, you can make the recipe without it and still get a good loaf. sorry for the late reply. As perfectly pointed out by Weekend Bakery team, diastatic malt powder contains sugar breaking active enzymes (mainly amylase). The amylase enzyme in diastatic malt powder breaks down starches into sugars, thus helping with rise, crust and crumb texture. It is completely optional though. Hello Stefano, I like using a mussels pan. Do you prepare your pan with butter or a layer of baking paper. I had a problem ones not getting the bread out of the pan, so now I’m scared and always put a piece of baking parchement in my pan. I never tried a Dutch oven. Is it a creuset or do you mean cast iron? I would be very scared that it would stick to the cast iron since it is not realy smooth. The bread looks amazing and I would like to try it ! I use a cast iron pan, it’s a really basic one from Ikea (Ikea Senior is the product name) but sometimes I use also a Pyrex one. In both cases I use a sheet of baking paper, but I’m sure it wouldn’t stick even without it. I cannot wait to bake this bread! I loved your story and can relate! Baking bread and being in the kitchen is the most alive I am ever! There is something so honest and decent about baking bread. Thank you for your recipe and your story. Best wishes obtaining your dream. thank you for your kind words. I agree with you, baking bread is so relaxing.. I travel a lot, but when I come back home I can’t wait to bake some bread or croissants or pizza, and enjoy them with my family. 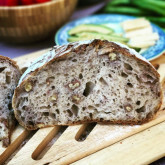 I own a wood oven bakery in Blackwood, SA, Australia and am interested in trying your walnut bread. 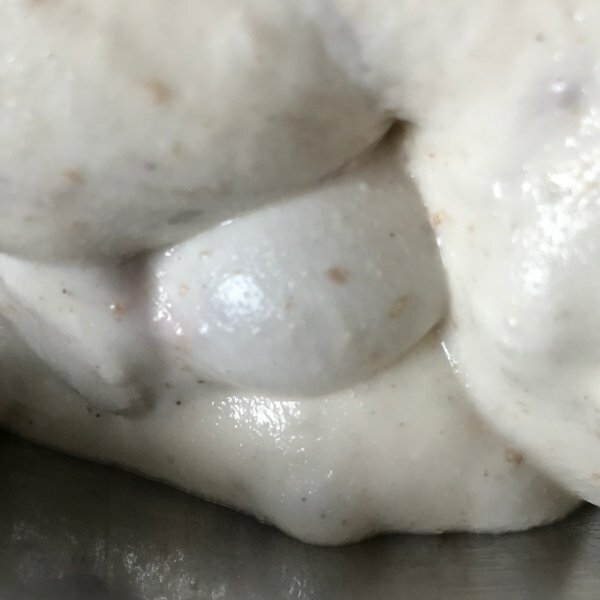 I was wondering if you could clarify a point – you seem to use 50g rye starter to make the poolish and then a further 50g rye starter in the dough. Is this correct. I assume that as you increase the number of loaves you make you also increase the second amount of rye starter. Is this correct? We do not know if Stefano is available soon to answer your question but we assume his answer will be yes. Thank you WB. Looking fwd to baking up. sorry for the late reply. You are right, as I bake more loaves I increase the second amount of rye starter. do not have the Sourdough starter? for sure it is possible, nevertheless I think that all the recipe would need to be reviewed (and tested). I’ve never tried with dry yeast. I have just tried your sourdough with walnuts. Wow it’s amazing. It’s a shame I can’t post the photo on here. I had to make a couple of substitutions though. I didn’t have any barley malt flour so I used 6g of Malted flour from a local mill here in the UK. I also used my own combination of wholewheat and strong bread flour that I get from the same miller. I also mixed in the Kitchenaid since my arms aren’t up to it. The only other thing I changed was the proving time, since it was getting too late to cook it, I put the banneton in the fridge and left it overnight. This long slow prove meant it had so much flavour. My rye starter is 6 years old now and I refresh it every 2 weeks and keep it in the fridge in-between. Thanks for this recipe, I can see me making this quite often. Also looking forward to having a go at your Foccacia. We would love to see them too. Thanks for your message! I’m glad you enjoyed baking and eating the walnuts bread. It’s my favorite. Sometimes I do as you did, putting the banneton in the fridge overnight. As you mentioned, the long cold rest is improving the flavor. Lately I’ve been baking sourdough focaccia, with great results. I’m still fine tuning the recipe, to find the good balance between different types of flour. I’m getting there. Thanks for your words of encouragement. I am going to make the same recipe again today to see if I can get better holes in it. And I’m definitely going to try your sourdough focaccia when my guests come this weekend. 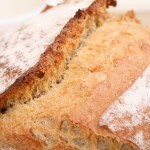 I have uploaded my pic of the bread to the website so hopefully they will publish it. Is it 50 gr. or 50 grams of Rye starter…? With the ‘gr’ we are sure Stefano means 50 grams of rye starter. Thanks for your message. Just to understand, what is “gr.” for an American? English is not my native language. I bought a scale from Amazon.com. It weighs in grams, ounces, pounds, and milliliters for about $13.00 dollars. It’s called 1by one digital scale. It works very well. Thanks Jim, for your tip. Wishing you many wonderful loaves! I started with a bread machine as well, years ago. I hope you are going to explore the oven baking and also sourdough bread sooner or later. Nice blog, by the way! Keep up the good work. Stefano, thanks so much for your kind words! I was just thrilled to read your reply, didn’t expect it, especially the part of you starting with a bread machine, too. Your words give me a lot of encouragement! Can I also bake this bread in the oven because I would like to bake few of them. sure you can, of course you should add some steam into your oven to improve the crust. You could put a cup of water in the bottom of the oven to generate steam. The baking time might change compared to my recipe. I suggest you to try and adjust the time based on your oven. I have translated your comment using Google Translate, so I’m not sure if I got it correctly. The malt I use is diastatic-malt, basically it is sprouted barley flour. The non diastatic malt, often available as sort of honey or molasses, is a different thing, and it is used only to give colour and flavour to the bread. The non diastatic malt has no active enzymes though. Diastatic malt, in addition to the coloring and flavoring effects, also affects the developing chemistry of the dough. I suggest using diastatic malt then. The second question seems to be about the type of flour you can use: you can use bread flour (white flour) or whole wheat flour. Of course the results may vary, the strength of the dough is determined by the protein %. A whole wheat flour may have a lower % in proteins. I was reading in your story that you also love to bake focaccia for your loved ones. I would be so happy if you would post the recipe for focaccia. I have not been able to find a recipe that is like the focaccia I had in Levanto, Italy. It was fantastic, crispy and yet chewy on the inside. Hope Stefano will find the time to respond to your question. As you can see he is a guest author on our WKB site who was kind enough to share a recipe with us bakers. I spent my childhood in Portovenere and Levanto, since I lived there until I turned 18. Great memories. I love focaccia, and I bake it regularly when I’m at home with my family. See my recipe below. Onion rings, olives, rosemary, etc. Dissolve yeast in warm water and then pour it into the mixer bowl. Add 40 ml of olive oil. 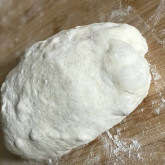 Add flour and salt then mix using the dough hook, until the dough is smooth and all the flour has been mixed correctly. Pour 50 ml of olive oil on the baking tray and then put the dough on it. Use part of the oil to grease the top of the dough. Put the baking tray in the oven with only the oven light on (to generate some heat) and let it rise for 1.5 hours. The dough should double its volume. Now using your hands gently press the dough and shape it to fill the baking tray. Check that the dough surface is well oiled. Let it rise for another 30 minutes in the oven (light on). 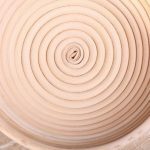 At this point use your fingers to create “holes” in the dough. Pour all over the dough the remaining 50 ml of olive oil. Add some ground sea salt. At this point you can add a topping, sliced tomatoes, rosemary, onion rings and so on. Let the dough rise for another 30 minutes in the oven (with the light on). Remove the baking tray from the oven and heat it to 220-230 °C. When the oven reaches the temperature, spray some vaporised water on the dough (you can use a water sprayer). This will help the rise of your focaccia. Put the baking tray in the hot oven and cook for 15 minutes. Keep an eye on the focaccia, every oven is different and you must check it. Thank you Stefano, so great to see you sharing your authentic focaccia recipe. Love to taste it. Already printed it and will try it very soon! Hello Stefano and Ed & Marieke! 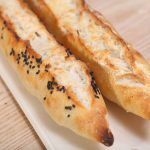 Thank you so much for responding to my post about Focaccia! I am so excited to try it. I appreciate your response! This bread is one of my best memories of Levanto. 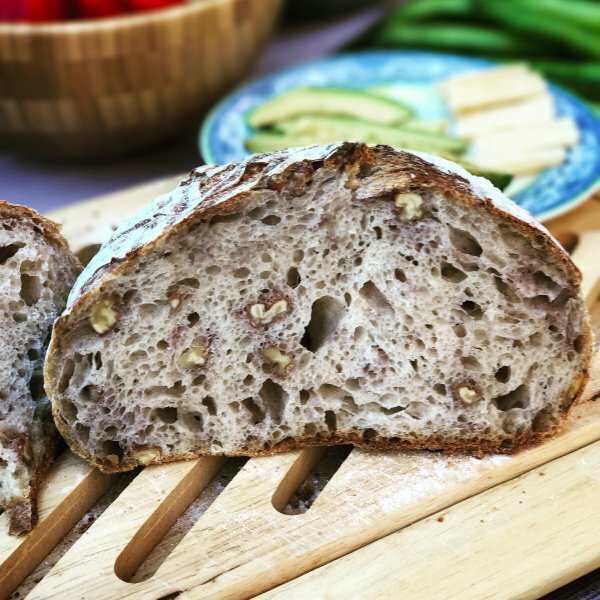 Thanks for this wonderful website I recently got back into backing and had an exciting time getting my rye sourdough going…made a couple of recipes so far and enjoying the whole process…my best so far has been this recipe…love the nuts in my bread. Thanks for the wonderful site. Thank you for your message, Chinmaya. I’m glad you enjoyed the walnuts bread. I love it too. Hello, I am trying various walnut and fruit loaves to recover my great grandmother’s holiday recipe. It was a family favorite, but she did it by taste and didn’t leave a recipe. I’m enjoying the bread maker’s journey, too. The recipe above wants barley malt flour. Is that Diastatic (flavour-neutral), or Non-diastatic (adds flavor, aka “Malt Powder.”). I use diastatic malt, in the form of malted barley flour. As far as I know, the non diastatic malt is used mainly for colouring the crust, while the diastatic malt contains active enzymes. The enzymes help the rising of the dough, but you shouldn’t add more than 1-1.5% of diastatic malt (5-6 grams on 455 grams of flour) otherwise the crust might become “gummy”. Nice to read your story. I am also in the IT industry for about 20 yrs now and secretly dreaming to have my own small artisan Italian style bakery. Will try your recipe soon. Have to startup a rye starter first. Only ha a wheat starter currently. glad to hear that I’m not the only one baking and working in IT! I think baking is a way to relax and forget about all the stress we have at work. To me it’s a great pleasure when I come back home in the weekend and I know I’ll be baking something, to be shared with friends and family. I baked a loaf of walnuts bread recently, using 50% of durum wheat flour and 50% of organic “tipo 2” Italian flour. It was amazing. There’s a clear connection between working in IT and loving the science of bread baking and beer brewing. Baking shows on TV almost always have one candidate with an IT background. 1. you said you are trying out beer breads are you replacing the water completely with beer? Are you still using a starter? I have a recipe that uses beer and water in lieu of starter. Yes, I’m completely replacing water with beer. I still use a starter, the recipe and the process are exactly the same, except for the beer/water swap. Thank you for sharing your recipe and your inspiring story, Stefano. 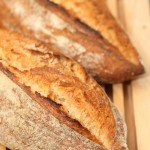 I baked in the past using buckwheat and bread flour (farine type 65 in France) and walnut. Will definitely try to bake this recipe in the coming days. glad to hear that you liked my post. I plan to bake a walnuts sourdough bread using spelt flour (mixed with high protein flour) in the coming days. I love spelt and the nutty flavour it gives to bread. I’ll try to make that tonight. But why do you put also starter in the final dough? Is the poolish not enough? It depends on the strength of your starter. With my rye starter I prefer adding a bit of it also in the morning. You can try both methods though. This is a recipe I’d like to try. Can I ask you a question? Do you use a stand mixer for mixing and/or kneading, or do you mix by hand? I usually mix the dough by hand. If I’m making a bigger amount of dough (e.g. for 2 or 3 loaves) I use the Kitchenaid mixer with the hook, 4 minutes at speed one, a couple of minutes of rest, then 3 or 4 more minutes, always at speed one. Many thanks for publishing this recipe, Stefano. It looks very similar to the walnut bread that I frequently buy when on holiday in France. I’ve just taken my first attempt out of the oven and it looks great (can’t wait to try it once it has cooled). I had to substite the bread flour and wholemeal flour for types that I already have, used white flour sourdough starter and baked it in a ‘La Cloche’, but hopefully these changes won’t matter too much! Glad to hear that! I baked one loaf yesterday as well, it was very good. I recently tried to replace water with dark beer in my recipe, the result was amazing, great color and the crumb was very soft. Let me know if you are happy with the results. Before we got our stone oven, we also used a la cloche and had great results with it too. It’s an excellent ‘oven in an oven’. Thank you for sharing this recipe. We love it and it is now on high rotation at our place! I use a wheat starter at the moment so switch in a little whole rye for whole wheat and it works beautifully. thanks for your feedback. I’m glad you liked the recipe! I’m now exploring the beer sourdough bread, I’m basically using beer instead of water, different kind of beers. So far I’m very happy with the results. This is precisely the recipe I’ve been looking for. I will try it next week. let me know about the outcome. Love to read your story Stefano, and I loved the recipe too. I’m definitely going to try it myself. Thank you for sharing it! let me know the outcome! Stefano, Thank-you for sharing your passion and your recipe. You described your handling of the dough very well. As a home baker, I will enjoy making this recipe. I have a question – would toasting off the walnuts leave a nuttier flavor? I’ve never tried to toast the walnuts. I’ve read that in some recipes. Definitely worth trying! I can’t wait to try this loaf! I love walnut sourdough loaves. Thank you for sharing and I hope you will do more guest posts! I had never made sourdough before and found your easy starter page and have really enjoyed it! Where I currently live, I can not find good artisan bread and decided I must try and make it myself. The rye starter is so forgiving, I find. And your approach is…very approachable. Just wanted to say thank you. Keep the recipes coming! glad to hear that a new home baker is joining the sourdough “army”. I love the passion that shines through the story and the recipe looks like an excellent one. Will definitely make this bread! Thank you, and let me know the outcome! We love walnuts bread, I hope you will love it as well. Hello Stefano , so very nice to read the story on your family’s legacy and their passion fir artisan baking. I hope to have a legacy like yours for the next generation to continue on. I love to learn from you when I go to Italy this coming October 2018. I will be staying again in Lucca as I we did last year. Lucca is not too far from CTerre by train. 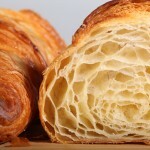 I am just an avid home baker who loves to learn, I have used weekendbakery website to bake my croissant, kouign amann, baguettes, focaccia and more. Please let me know the possibilities for class with the master this October 2018. Thank you also for your nice heartfelt comment. We contacted Stefano and hopefully he will be able to respond himself soon. Thank you for your message. Are you going to come to Italy this October (2017) or next year (as per your message)? So far I’m not organized to train people, I live most of the time in Switzerland and I come back home in Italy only twice per month. Of course I’d like to start some small class to share the passion for baking with other people, home bakers like me. As soon as I plan something I’ll let you know. Lovely ! I want to try this recipe soon. I’m an amature baker and typically i’ve been feeding my starter in the evening and then using it in the morning, mixing it in my flour recipe. But I don’t create a poolish. 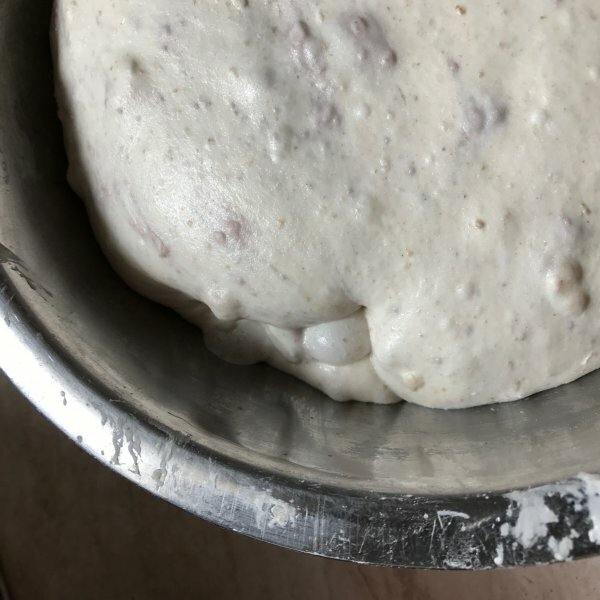 What is the difference between the poolish and the starter? I thought the poolish was the starter and or vice versa? But by using both are you using two types of levain culture ? We contacted Stefano and hopefully he will be able to react to the comments soon. 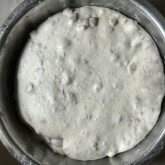 The poolish is a portion of the ingredients that is mixed ahead of time, typically the night before baking bread. It is made using flour, water, and a small portion of your starter. Using a poolish improves the fermentation process and generally releases more complex flavors in your bread. 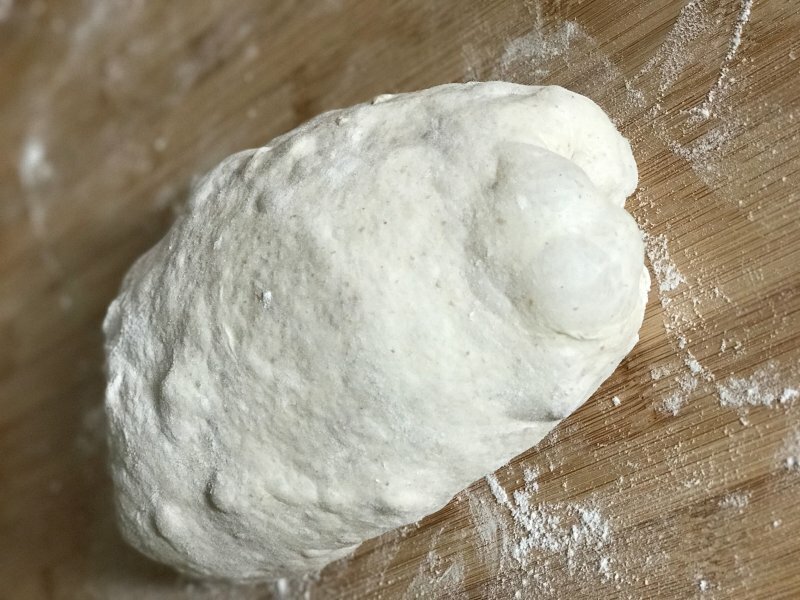 On the other hand, the starter is a culture of wild yeast and bacteria that is perpetuated by adding periodically flour and water (using the same percentage, 50% water and 50% flour). 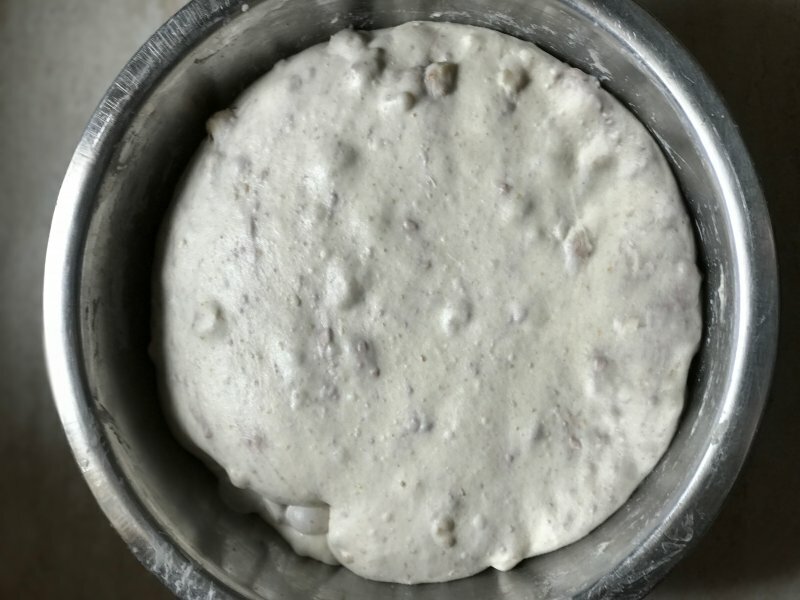 Basically I like to think that the poolish is a very young sourdough starter, because it is a starter that has been fed with flour and water just 12 hours before being used. In Italian we use the term “lievitino” for poolish. “Lievitino” means “small lievito” (lievito=yeast). That was a lovely story. i loved reading it. Thank you. i am going to bake your walnut bread it looks amazing. Would it be possible to share a sourdough pizza recipe how to make it and the temp to bake it in a electric home oven I would be so happy to make it. Thanks for your message. I’m currently on holiday, in Greece. 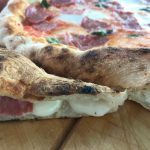 As soon as I get back home I’ll share my pizza dough recipe! Looking forward to your sourdough Pizza dough recipe. Your Loaves More 1 ! Your Loaves More 2 ! Your Loaves More 3 ! A baker’s dozen: Our 12 plus 1 best baking tips! A new pizza adventure begins!